Many thanks to reader N. for this !!! 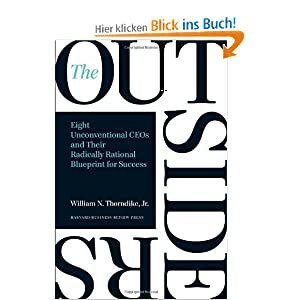 I would like to recommend the book: “The Outsiders, Eight unconventional CEOs and their radically rational Blueprint for Success”. It is written by William N. Thorndike Jr. and a team of Harvard students. I first heard about the Book in the write-up of the annual Meeting of the Daily Journal as a book recommendation from Charlie Munger. When reading the subtitle of the Book I was really eager to read it as soon as possible. My first impression is that the book, considering its high price, is fairly short. The book has only got 225 pages. 1. Run a decentralized organization which releases entrepreneurial energy and keeps both costs and “rancor” down. 2. Cash flow, not reported earnings, is what determines long term value. 3. Share buybacks increase in per share value and in the long run that is the only thing that matters – not the overall growth of the company. 4. With acquisitions, patience is a virtue… as is occasional boldness. The author of the book points out that the outsider CEOs shared an interesting set of personal characteristics: They were generally frugal and humble, analytical, and understated. They were devoted to their families, often leaving the office early to attend school events. They did not give chamber of commerce speeches, and did not attend Davos and last but not least they did not exude charisma. The outsiders are not like Jack Welch an example of a charismatic, action-oriented leader. They are more like Ben Franklin; they avoid bankers and other advisers and prefer their own counsel and that of a select group around them. It is a quite interesting read with many interesting stories about the company’s and the CEOs. The book is really easy to read and there are summaries at the end of every chapter. At the end of the book, the author presents the outsiders mind frame in a simple approach and a checklist. But I did not think that it is as easy as it seems comprehending the book. I think you always need the right time and the right location to be successful. So if you want to enjoy a well written book about a really interesting topic which can help you figure out the right management of the company in which you like to invest you might consider buying it. Thanks for the review. “The Outsiders” offers extraordinary insights, especially when limited organic growth requires flexible resource allocation. In the summer of 2010, I invested in company of this kind, a rather small company with 75 m USD market cap and no analyst coverage. Average volume was 1,500 and currently they have one of 15,000 (turnover abouve $1 million). I think that book boosted the demand for such companies, what explains a good part of today high prices there. i just read the book myself. I consider it as a “must read” book especially for capital allocation.